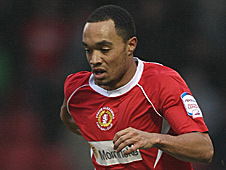 Striker Byron Moore has signed a new one-year contract with Crewe Alexandra. The 22-year-old, who joined Crewe as a 16-year-old, had been stalling over an offer from the club since last November as he considered his options. Moore had not made any contact with Crewe since May, but has now returned for pre-season training. Despite being earlier linked with Carlisle United, Moore has failed to attract any real interest since the end of last season. Moore made his first-team debut on the opening day of the 2007/2008 campaign and has since made 102 starts for the Alex, scoring 15 goals. He was offered a contract on the same terms as those agreed by other homegrown players such as Shaun Miller, Luke Murphy and Ashley Westwood. The striker initially rejected the deal because he wanted to play at a higher level, but a lack of interest elsewhere is thought to have prompted a re-think.